After school got out for the summer my oldest went to camp each morning for a week. The younger two were bummed they were missing out on all the fun so we invited some of their friends over for a pancake themed play date! Everyone wore their pajamas to get into the letter P and pancake spirit and we started off the fun by making pink pig noses! (Did you catch all the P words so far?) We talked about the sounds animals make and how letters make sounds too. Instead of oinking they pretended that they were pigs that said, “Puh!” and had lots of fun puh-ing around the pretend pig pen. After being little piggies they were ready to read! 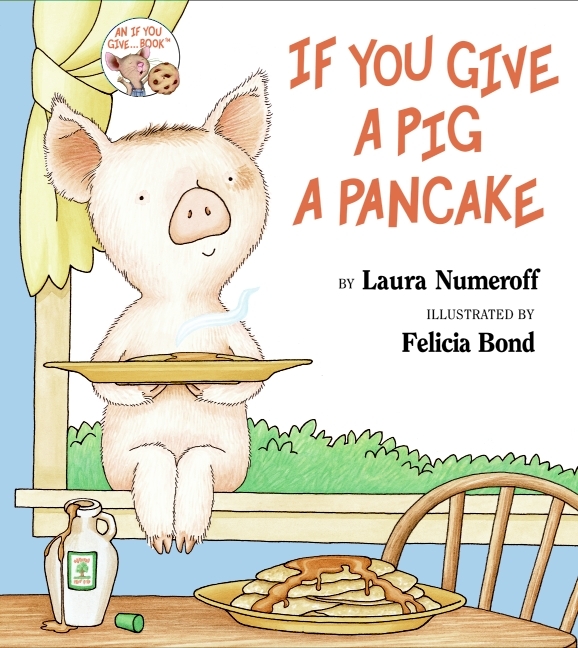 We read If You Give a Pig a Pancake by Laura Numeroff which is one of our favorites. The kids love to predict what the pig will ask for next and as you can tell by the title there are lots of P words to play with. 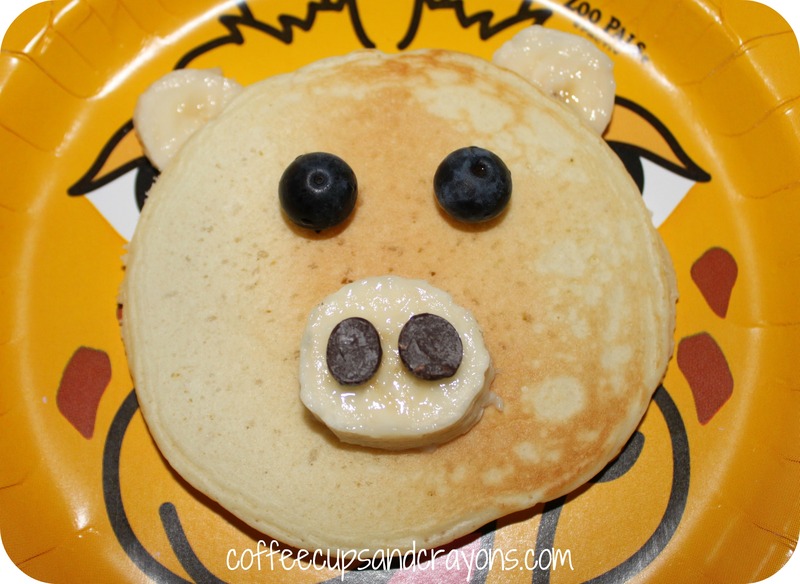 After we read and discussed the story the kids got to put their noses back on and “puh” when we found the letter P.
If You Give a Pig a Pancake is a circular story, the plot line literally comes full circle, so what better way to sequence the story events than on a round pancake! They all did a fantastic job of recalling story events and then placing them in order–such a great book to use to work on these skills. 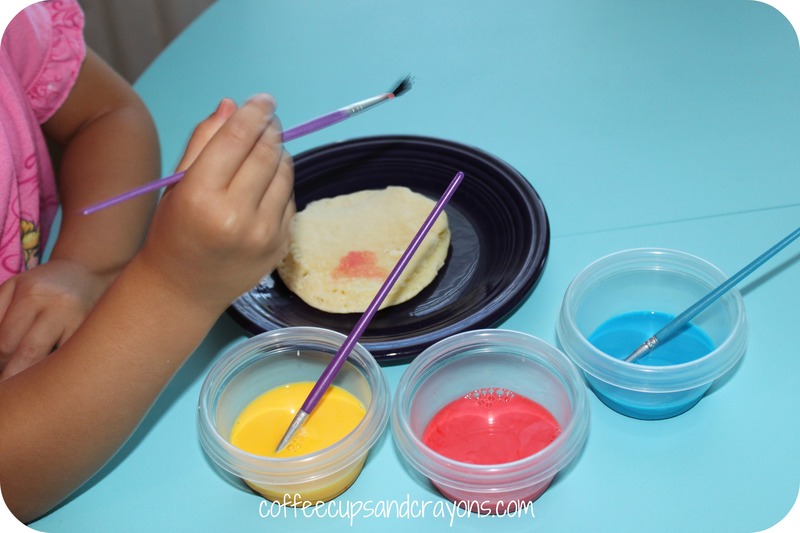 By this time the kids were ready for a snack so we painted some pancakes to eat! My husband premade a bunch of pancakes for the kids the night before and they used a mix of food coloring and 2% milk to paint designs on the cold pancakes. Then I put them in the oven to warm and dry the designs while they kept painting. 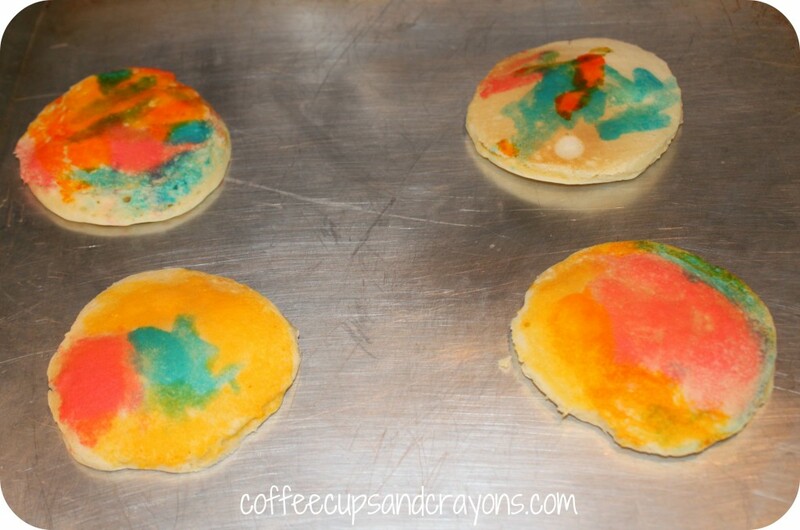 I love how fun the colors look on the pancakes–we usually only paint toast and I can’t wait to do this again. It would be so much fun for a birthday breakfast! While they ate the 4 year olds played with our word chunk sliders. The first word the “an” chunk slider makes is pan so it was perfect to start with. They had fun sliding the stick to make and read the different “an” words and came back to them later to work with other word families too. Then it was time for some games! They had a blast with the pancake relay. But the pancake toss was much more fun for me as a spectator! It was hysterical to watch them practice their gross motor skills by trying to toss and catch the pancakes. There were definitely a lot of giggles during this one! 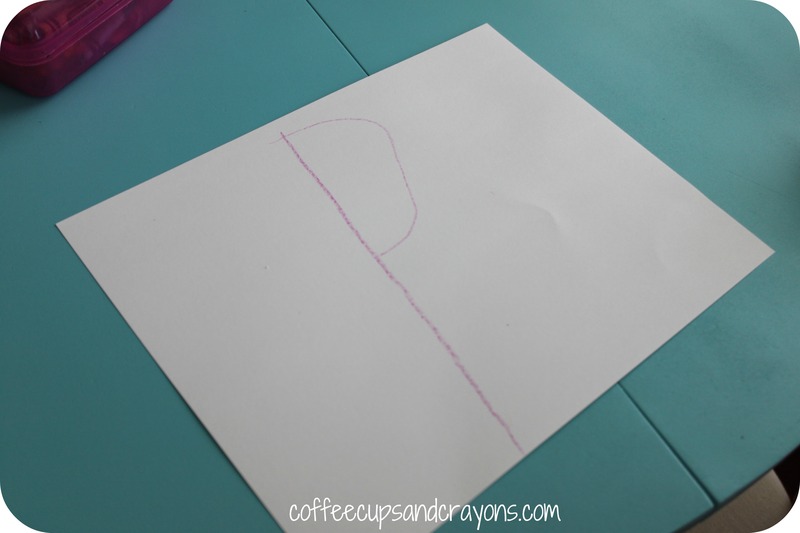 After some games we practiced writing Ps a couple ways and then turned the letter P into a picture! The 2 and 3 year olds made the P into anything they wanted and the 4 year olds turned their Ps into pictures of P words–including a great big pizza! Then it was lunch time! More pancakes, of course. Each of them got a pancake pig, scrambled eggs, OJ, berries, syrup, and even some mini-chocolate chip pancakes! 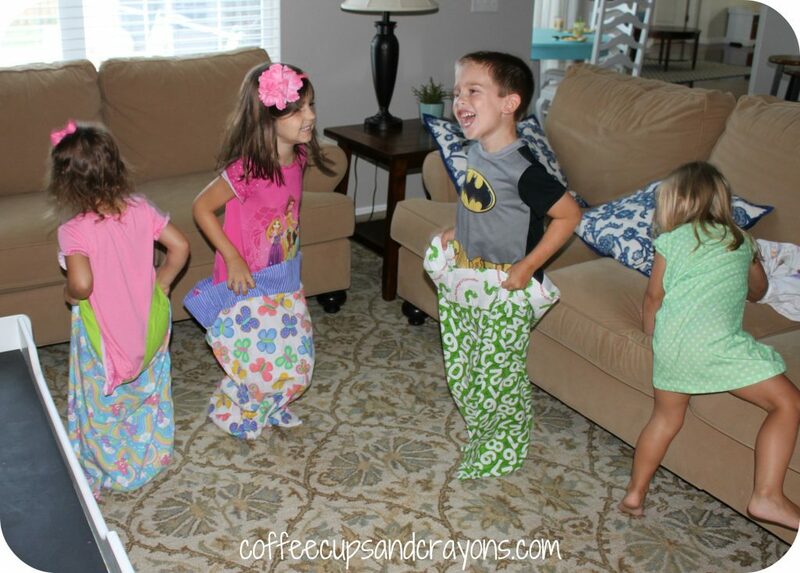 After lunch we had time for one last game–pillow case races! 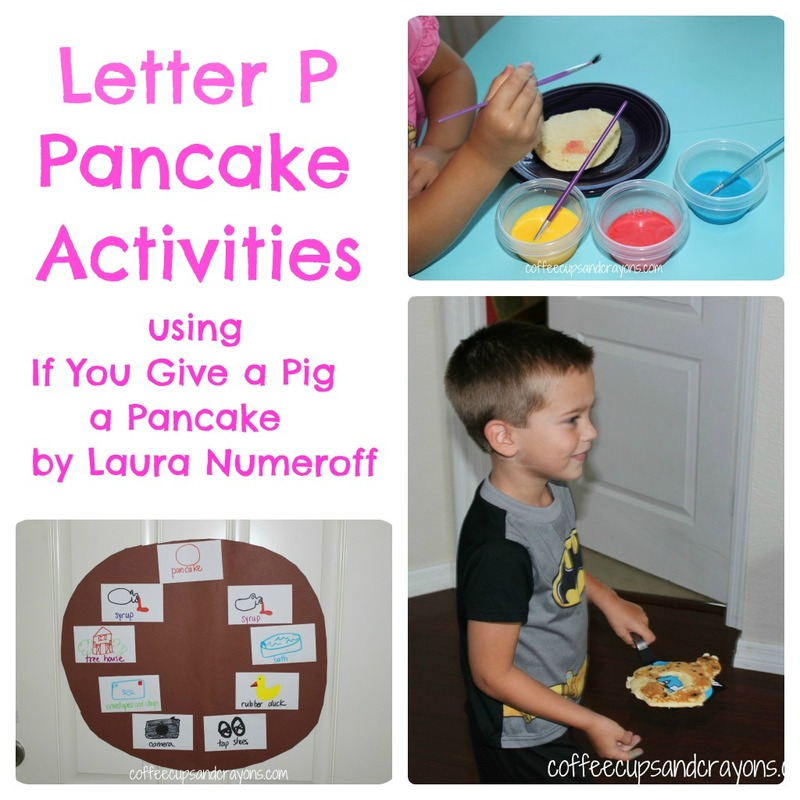 There are so many fun things you can do with pancakes and the letter P.
What other If You Give a Pig a Pancake activities have you done? This looks like such a fun play date. Great theme! That is a great post. You did so many things with the letter P. I am sure kids would want to jump through the screen and join your party! I love the pig pancake. Artsy Play Wednesday on Capri + 3 starts tomorrow, July 11th. 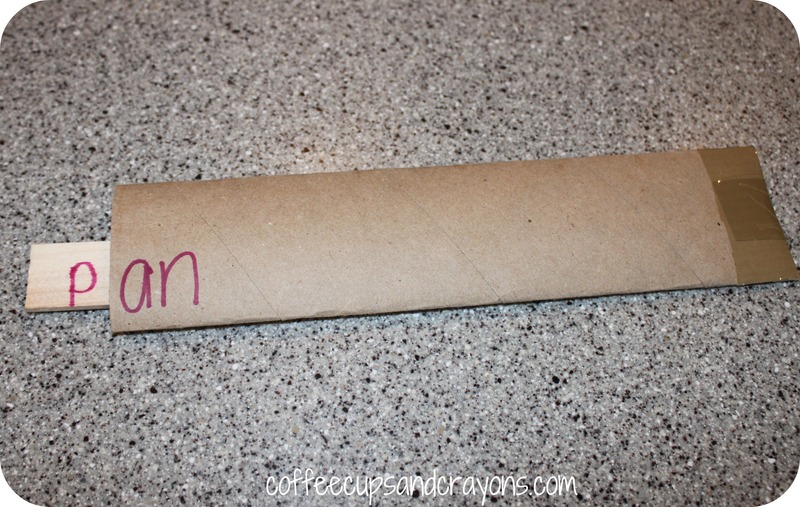 It is a new weekly linky party for posts about arts crafts and play activities. I hope you will stop by and link to this post (and any other posts related to the theme). I hope to see you there. Thanks so much! 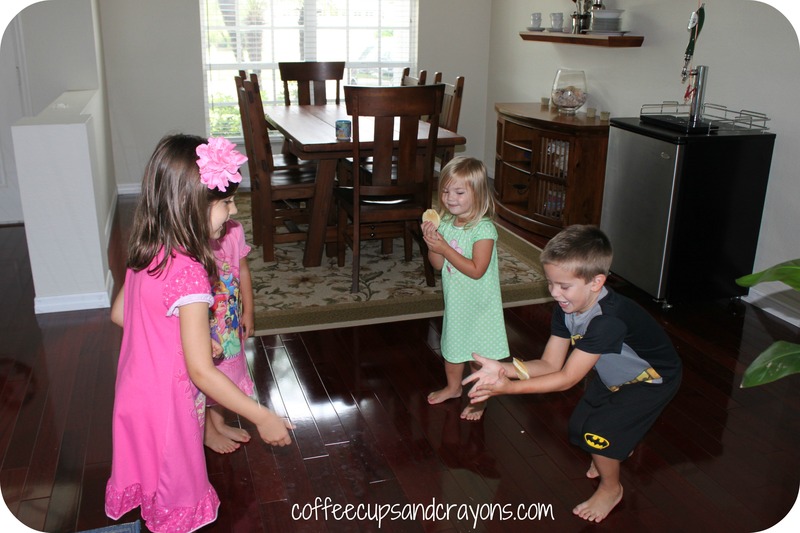 They had fun with everything but, definitely loved getting to play catch with pancakes! Thanks for stopping by! If You Give a Yak a Yolk would be an instant classic! So far though the only characters are a cat, mouse, moose, pig, and dog. We’d be all for going A to Z though. That’s actually a great rest time activity for my big kids! Great ideas! 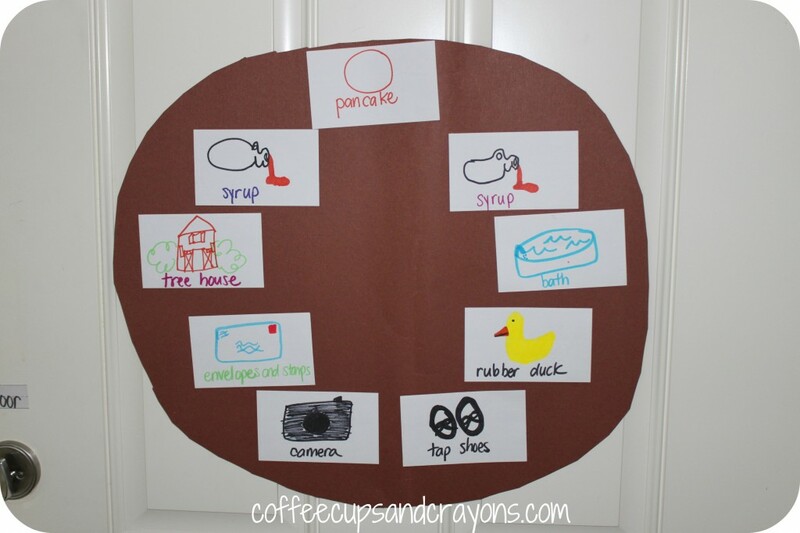 My girls would love to do a pancake toss — can’t wait to give it a try! Love the painted pancakes too!! Thanks so much! The pancake toss was both fun and funny–something for both the participants and spectators! What cute activities! 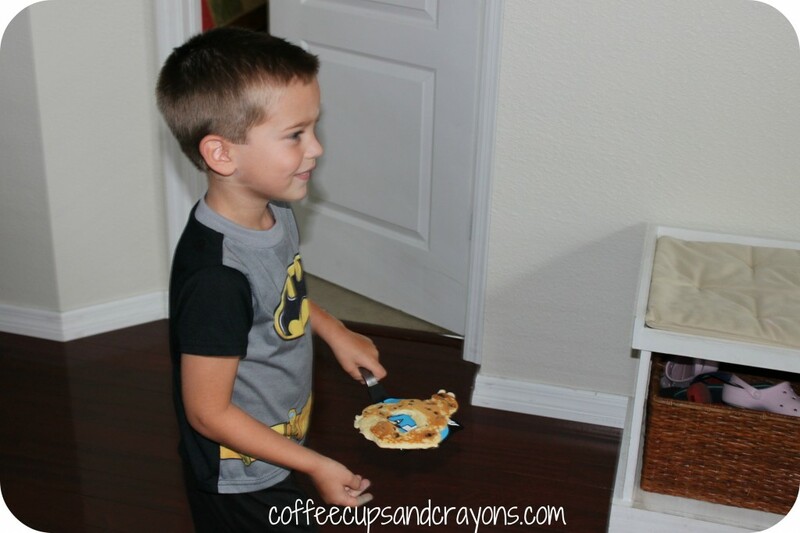 We love that book and my kids would love all the pancake fun!! Thanks! It was a blast…although they didn’t request pancakes for breakfast or lunch for over a week! Ooo I lovetheway pancake pig, he’s so cute! 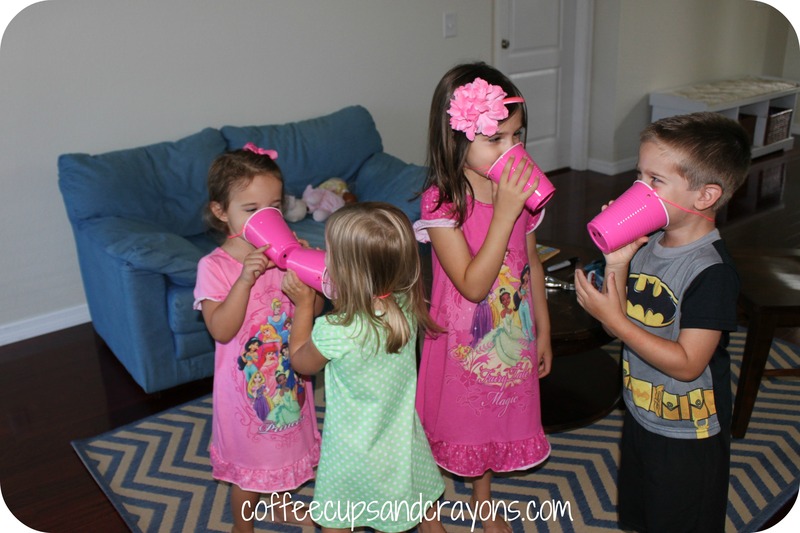 Great idea to make your own mini summer camp. I’m really glad that you made the comment about the letter sounds. This was a HUGE topic when I taught Pre-K. I still find myself cringing when I hear someone add that “uh” sound to letters. These ideas are super cute! I’ll have to keep these in mind for our summer playdates! I feel the exact same way Courtney! Thank you so much!